Home » Derma Life Mono Tone - 4 fl. oz. A unique synergistic formula that can normalize certain discolorations in skin cells that are caused by excessive pigmentation formed in the skin cell, this is usually a result of hormone imbalance or damaged tissue. Melasma, sun or age spots are a few of the types of discoloration people experience. MonoTone can normalize discoloration resulting from acne scarring and other skin damage. 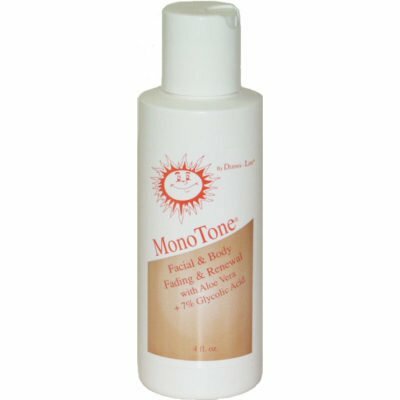 MonoTone lotion has 7% glycolic acid which causes the pigmentation to normalize over a few months of regular use. The dark areas will start to lighten after three or four months of daily use. Secondary benefit is reduction of fine lines and wrinkles in the face and around the eyes.